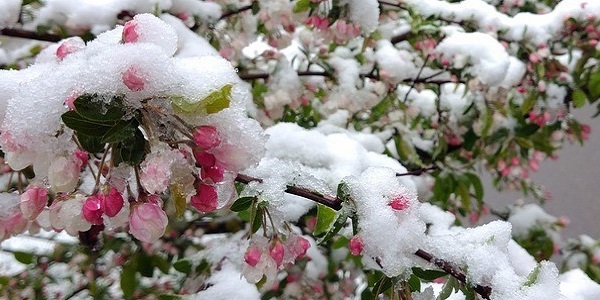 The month of April felt like a continuation of winter featuring well below average temperatures combined with above average monthly snowfall across the Midwest. We began the month cold in the Chicago and Rockford area as high pressure to the west allowed for Canadian air to sink into the region. Highs usually begin the month in the mid-50s, but we were stuck in the upper-30s and 40s through the first week of April. Overnight, it is usual for temperatures to be in the mid-30s but most nights fell into the low-20s and Rockford even dropped to a chilly 18 degrees early on the 2nd. 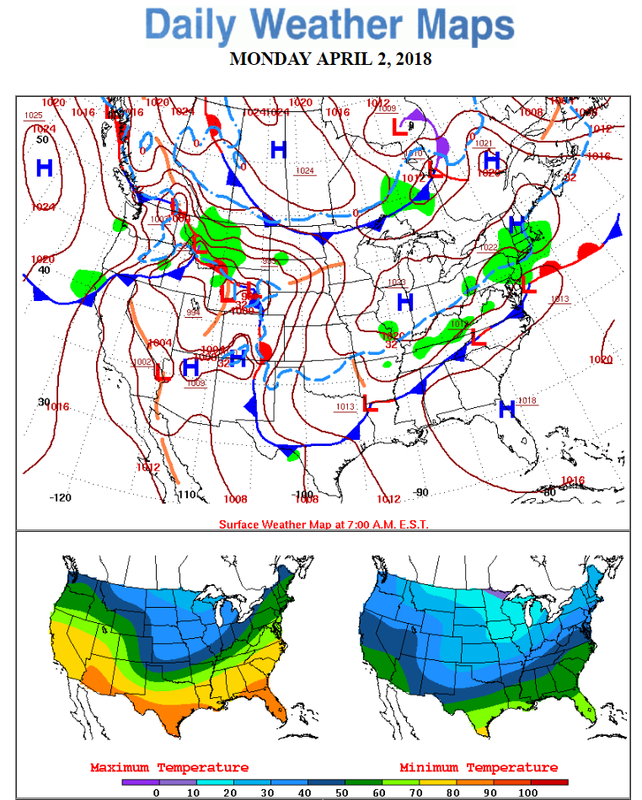 On the 11th and 12th, there was a brief reprieve from the cold as a disturbance approaching from the south pumped warm air into the area prompting temperatures to jump into the mid-60s followed by a day in the low-70s. After that, the cold returned with a vengeance as temperatures plummeted below average for the 3rd week of the month. With daytime temperatures usually near 60 at this time, we stayed in winter-mode barely breaking out of the upper-30s and 40s. Rockford broke its daily record for lowest, high temperature when it only rose to a high of 34 degrees on the 15th. The final week of the month moderated a bit and on the 30th the area saw highs near 80. All-in-all it’s not surprising that the area finished 6 – 10 degrees below average for the month for both daily maxes and mins. On April 2nd, overnight temperatures plunged into the upper teens and low-20s as cold, Canadian air sunk into the region. A similar story unfolded in the Ohio Valley with below average temperatures invading the region through the first week of April. Highs are usually in the upper-50s, near 60 for this time of the year and it was tough even getting out of the 40s with Dayton seeing a high temperature of only 37 degrees on the 9th! A short-lived warm-up struck from the 12th-14th as southern air surged and highs jumped above average into the upper-70s with Columbus seeing 82 degrees for a high on the 13th. The third week of the month saw the same cool-down that Chicago and Rockford experienced. This was followed by a bit of a moderating period to start the fourth week of April before another dip into below average temperatures ended the month. Indianapolis broke its daily low record on the 29th when it fell to 30 degrees overnight, previously the record was 31. As such, we ended the month below average by 4 – 6 degrees for both daytime highs and overnight lows. 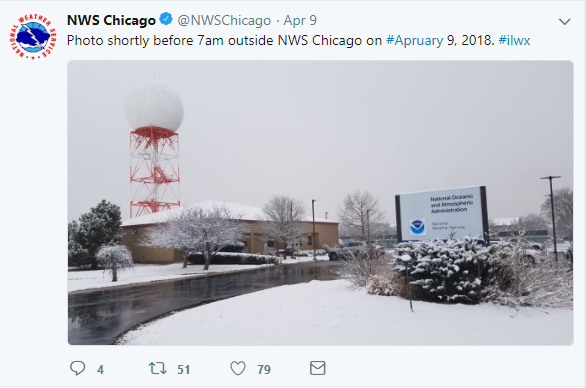 While snowfall in the Chicago and Rockford area was 1 – 3” above average for the month (normally we see about an inch over the course of April), precipitation as a whole was below average by less than an inch in Chicago and by as much 2 – 3” near Rockford. A late-season snow event approached from the west on April 8-9th and while most activity stayed out west, a quick 1 – 3” of snow fell. However, with prior daytime temperatures above freezing, it was tough getting much to accumulate on pavements. Mid-month, a potent disturbance brought between 1 - 2” of rain to Chicago, as well as a few tenths of snow. After that, things trended drier with little in the way of precipitation occurring for the second half of the month. A late-season snow event drops a quick 1 - 3" in the area on April 8th - 9th but has trouble accumulating on pavements. Snowfall and precipitation as a whole ended the month above average in the Ohio Valley. A cold front pushed through to start the month bringing a widespread 0.5 - 2.5” of snow to kick-off April. 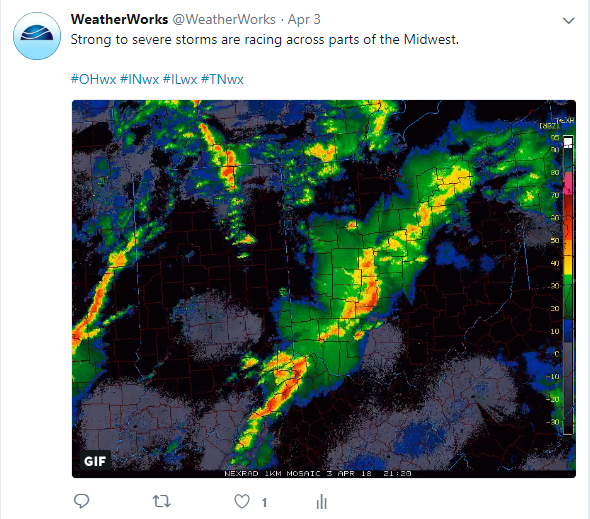 Shortly after on the 3rd, low pressure supplied a deluge of rain and some severe weather to the area with Indianapolis, Dayton and Columbus breaking daily rainfall records. Indianapolis saw the most rain when 3 – 4” fell across the area, the previous daily record was 1.92” set in 1892. After that, only a few light snow and rain events passed through the region before trending drier to end the month. By the end of April, snowfall finished above average by 1 – 3” along with above average precipitation as a whole. After a cold and snowy April, we can safely turn the page on winter and welcome spring!